Aquajet has been the UK distributor of OMAX Waterjet Machining and MAXIEM JetCutting Centres for the past 20 years. Established in 1993 to harness state-of-the-art technologies to make high-pressure abrasivejet machining practical, affordable, and easy to use – OMAX has become the world leader in abrasive waterjet systems, designing and producing its own machine controller, software, pump, and tables. Each JetMachining® centre is powered by the company’s innovative control software, bringing affordable abrasivejet technology to a diverse group of industries. OMAX recently released its new DualBRIDGE System option for large-table OMAX JetMachining Centers and the entry-level MAXIEM™ product line. The DualBRIDGE System configuration allows the inclusion of a second Y-bridge on the machine to boost efficiency and flexibility with abrasive waterjet cutting. An operator can program the independent cutting heads to produce separate parts or work in tandem to cut one large part, significantly increasing the machine capacity. Such an increase allows more workshops, from sheet metal fabricators to trade schools, to benefit from industry-standard performance at an incredible value. The latest high-performance, low-cost MAXIEM machines fall within the 2000 Series, 3000 Series and 4000 Series. The MAXIEM JetCutting machines all closely mimic OMAX’s premium JetMachining® Centers by applying the same extremely efficient ultra high pressure drive pump technology and sharing advanced features such as the robust Intelli-MAX® Software and Intelli-TRAX® linear drive technology for superior performance in harsh abrasive waterjet environments. Other shared features among the 2000 and 3000 product lines include floor or tank mounting options for expanded configuration possibilities, easy access USB ports and power/pause controller interfaces, high-pressure track plumbing for additional X-axis coverage and DualBRIDGE System compatibility, which utilises two Y-bridges for increased productivity. ProtoMAX® is designed for prototyping, light industry, technical education, artists and the maker movement. The system brings all the versatility benefits of large abrasive waterjet cutters in a sleek and economic package that is perfect for small job shops, engineering classrooms, makerspaces and personal use. It is also a handy addition for large shops and fabricators that need occasional waterjet capabilities to complement their other cutting systems. With a design that’s accomodating to educational facilities, the ProtoMAX is engineered to maximize instructional potential. Utilizing the same advanced cutting model and similar control software as OMAX industrial waterjet systems, the ProtoMAX can take students from the classroom to a production shop floor quickly and intelligently. Technology-GuaranteeOMAX provides free software upgrades for the life of the original ownership of the machine. This allows customers to take advantage of the latest updates and cost cutting techniques available. All new technologies are backward compatible, meaning the machine you buy today will be able to take advantage of any innovations made tomorrow. The first high performance, personal abrasive waterjet. Tthe revolutionary ProtoMAX is designed for quick and precise abrasive waterjet cutting. Capable of powering through almost any material, the ProtoMAX is the ideal solution for prototyping or small-scale production. 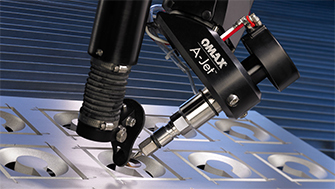 The A-Jet: a multi-axis cutting head that greatly expands the versatility of the OMAX JetMachining Centre. With a cutting range from 0° to 60°, this new technology can easily cut countersunk holes and precision shapes with bevelled edges or angled sides. OMAX Corporation’s exclusive DualBRIDGE System provides greater capability & productivity with independently operating Y-bridges. The OMAX DualBRIDGE System offers dramatic increases in productivity & flexibility. Are you thinking of setting up a Waterjet Business? We can help new start-up Waterjet Companies with a business plan, cashflow generator and marketing advice.